All three versions are available in Aluminium or Steel. The price is the same for different materials. Our current stock versions have 130mm, 140mm or 150mm wide individual louvres pressed in them but we are looking into stocking more sizes soon. If you would like something different please write to us at our email address speedex@speedex.com.au as we soon have ability to more easily custom manufacture. 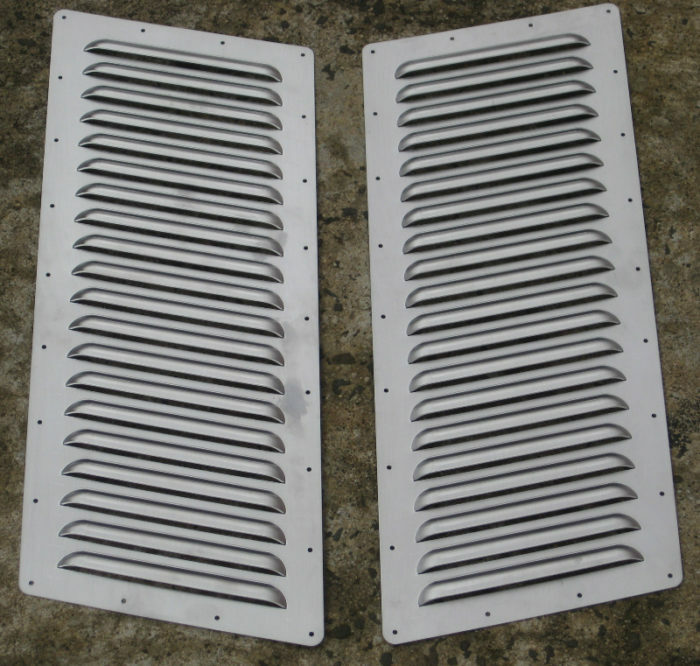 You can mount these louvres on your car bonnet, with the louvres usually facing with the louver opening towards the driver windscreen, so that air enters through the radiator, over engine and out through the bonnet louvre, and away towards and over the windscreen. Our Modern Bonnet Louver range will be expanded soon. We currently have all variations with 3.3mm clearnce holes to suit 1/8" inch rivet holes around the perimeter. But some customers have recently asked us if these panels can be supplied without rivet holes which we can also make and we will be hoping to add to the list soon with also some other sizes. So before our website is updated if you would like Modern Bonnets Louvers without rivets, please write to us directly at speedex@speedex.com.au and we can get some made for you. Until we have thse in stock. 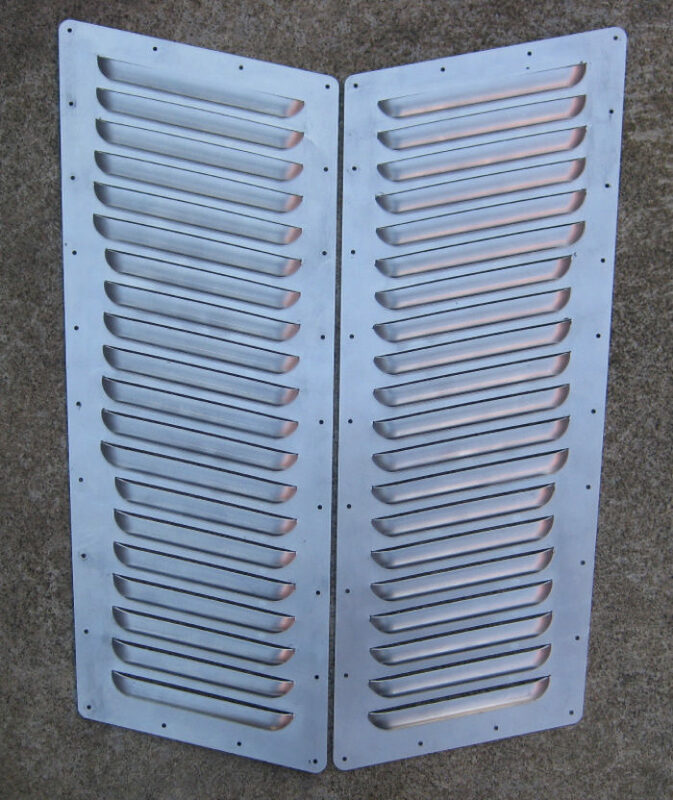 These Modern Louvers (150 - Straight) shown above are rectangular in shape and are symetrical between the right-hand and left-hand panels. Overall Individual Panel Size = 480mm x 200mm. Louver Size = 150mm wide louvers. Number of Louvers = 20 Louvers / Panel. Come with pre-drilled mounting holes to suit 3mm or 1/8 rivets. Louver Weight per pair = 850 grams approx for alumnium but maybe around 1.5kg steel. (Shipping dimensions and weights = 49cm x 21cm x 3cm approx. Wgt = 5kg approx - Shipping weight is greater as have to send by parcel post not satchel). These Modern Louvers (150 - Angular) shown above are angular in shape and are symetrical between the right-hand and left-hand panels. Overall Individual Panel Size = 525mm x 195mm. 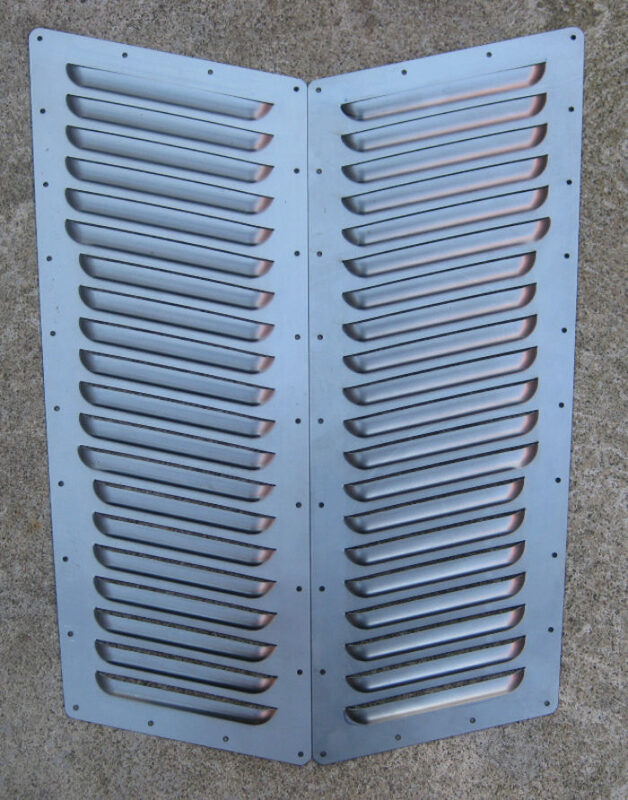 Louver Material = Aluminium (1.6mm thick, so very strong and not flimsy) or 1mm thick mild steel. Louver Style = Angular appearance. Louver Weight per pair = 850 grams approx. (Shipping dimensions and weights = 53.5cm x 20.5cm x 3cm approx. Wgt = 2kg approx). These Modern Louvers (130 -150 - Tapered) shown above are angular in shape, and also tapered aswell. So they are narrower in the front and wider at the rear. They are symetrical between the right-hand and left-hand panels. Overall Individual Panel Size = 535mm x 200mm. 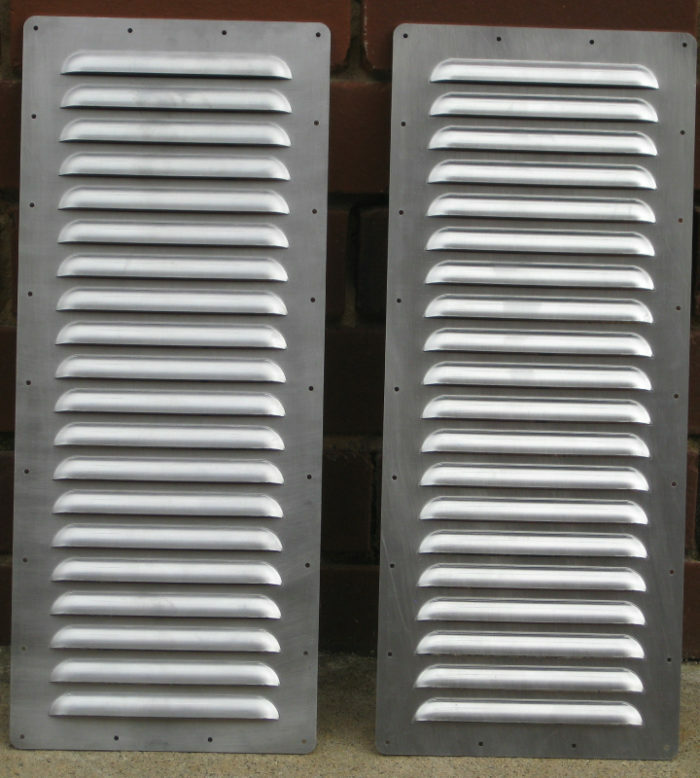 Louver Sizes = 130, 140 and 150mm wide louvers. 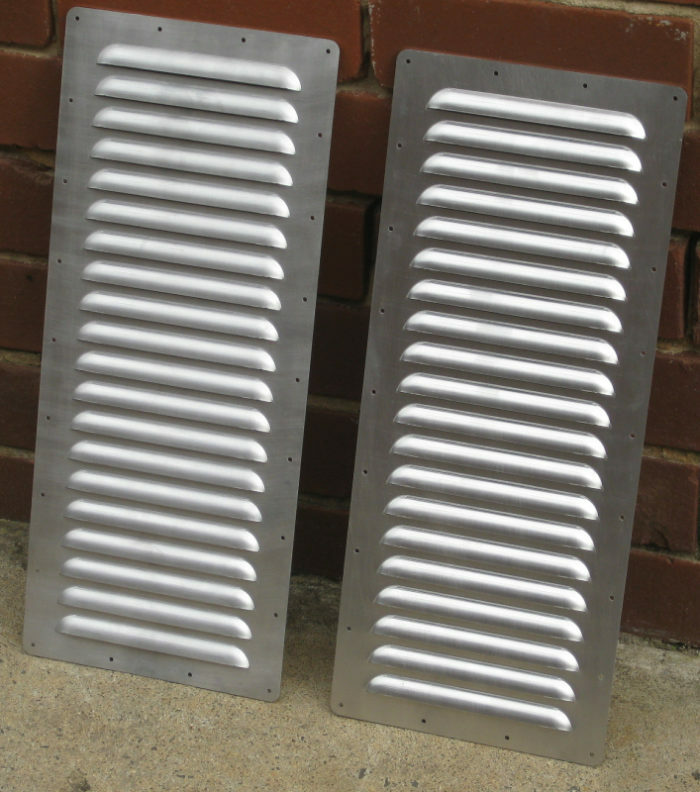 Louver Material = Aluminium (1.6mm thick, so very strong and not flimsy) or 1mm steel. Louver Style = Angular and Tapered appearance. Louver Weight per pair = 850 grams for Aluminium and 1.4kg for Steel. (Shipping dimensions and weights = 54.5cm x 21cm x 3cm approx. Wgt = 1.5kg (Alum) or 2.5kg (Steel).